What are potatoes? About the ingredient potatoes. Including 2,390 recipes with potatoes, nutrition data, photos, and where to find it. The potato contains vitamins and minerals, as well as an assortment of phytochemicals, such as carotenoids and polyphenols. A medium-size 150 g (5.3 oz) potato with the skin provides 27 mg of vitamin C (45% of the Daily Value (DV)), 620 mg of potassium (18% of DV), 0.2 mg vitamin B6 (10% of DV) and trace amounts of thiamin, riboflavin, folate, niacin, magnesium, phosphorus, iron, and zinc. The fiber content of a potato with skin (2 g) is equivalent to that of many whole grain breads, pastas, and cereals. In terms of nutrition, the potato is best known for its carbohydrate content (approximately 26 grams in a medium potato). The predominant form of this carbohydrate is starch. A small but significant portion of this starch is resistant to digestion by enzymes in the stomach and small intestine, and so reaches the large intestine essentially intact. This resistant starch is considered to have similar physiological effects and health benefits as fiber: It provides bulk, offers protection against colon cancer, improves glucose tolerance and insulin sensitivity, lowers plasma cholesterol and triglyceride concentrations, increases satiety, and possibly even reduces fat storage. 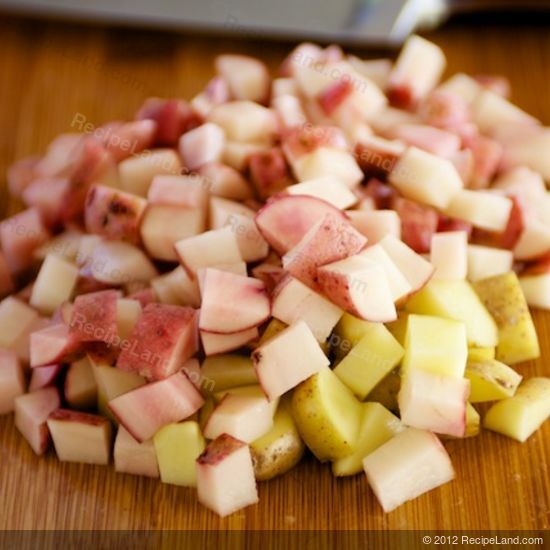 The amount of resistant starch in potatoes depends much on preparation methods. Cooking and then cooling potatoes significantly increased resistant starch. For example, cooked potato starch contains about 7% resistant starch, which increases to about 13% upon cooling. 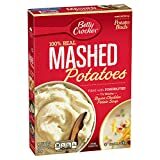 Made with 100% real Idaho potatoes Perfectly blended with real butter Natural and artificial flavoring Made in the U.S.A.
More detail Order now to save $0.41! More detail Order now to save $0.04! 1 - 4 oz. Idahoan Applewood Smoked Bacon/1 - 4 oz. Idahoan Baby Reds/1 - 4 oz. Idahoan Roasted Garlic & Parmesan Baby Reds/ 1 - 4 oz. Idahoan Bacon & Cheddar Chipotle/ 1 - 4 oz. Idahoan Butter & Herb 1 - 4 oz. Idahoan Buttery Golden Selects/ 1 - 4 oz. Idahoan Buttery Homestyle/ 1 - 4 oz. Idahoan Four Cheese/ 1 - 4 oz. Idahoan Loaded Baked/ 1 - 4 oz. Idahoan Sour Cream & Chives Homemade taste every time in minutes Made with 100% real Idahoan potatoes Pack of 10 flavors in a pack. Potatoes are usually found in the produce section or aisle of the grocery store or supermarket. Potatoes are a member of the Vegetables and Vegetable Products USDA nutritional food group. How much do potatoes weigh? There are 2404 recipes that contain this ingredient.